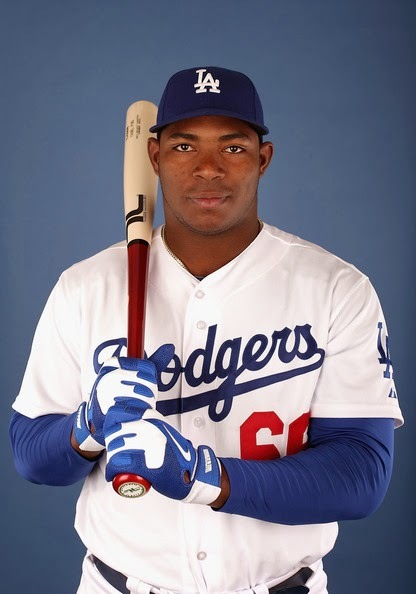 Dodger right fielder and 2014 National League All-Star candidate Yasiel Puig will make a special appearance at Viva Los Dodgers, held at the historic 76 station at Dodger Stadium, Sunday, June 1, from approximately 3:30 p.m. to 4:10 p.m. prior to the 5:05 p.m. game against Pittsburgh. Puig will take photos with fans for monetary donations that will go toward purchasing baseball and softball equipment for up to 180 youngsters at Department of Recreation and Parks, Lou Costello Recreation Center in Boyle Heights that serves the East LA community. One photo with Puig per fan will be taken by Blue Prints who will also provide a complimentary printout. The Los Angeles Dodgers Foundation and the Wasserman Foundation will match the donation total this Sunday in support of Puig. Lou Costello Recreation Center offers activities for all ages and for families to enjoy daily. It plays host to Summer Night Lights and is a positive place for residents to access and at which to play sports. Lou Costello Recreation Center’s youth programs also engage high-risk neighborhoods, Estrada Courts and Wyvernwood. The center supports youth baseball and is currently in need of baseball and softball equipment. For more information on Lou Costello Recreation Center visit www.laparks.org. Puig has connected with the Los Angeles community since his arrival on June 3, 2013. He co-hosted Cuban Heritage Day at Viva Los Dodgers held at Dodger Stadium on September 1 and made an appearance alongside several teammates at La Gran Fiesta Viva Los Dodgers on September 14. Puig remained active in the community in the offseason and became a supporter of youth baseball after a surprise visit to the Northeast LA Little League (NELALL) on October 22. He hosted all of NELALL for two play dates at Dodger Stadium, November 18 and December 10. Puig gifted the Little Leaguers with Dodger hats and T-shirts and joined them for a Dodger Dog dinner. The Little Leaguers also hit in the Dodgers’ batting cages, visited Puig’s locker and posed for photos with Puig in the Dodgers’ clubhouse and on the field. Puig has also visited Children’s Hospital Los Angeles (CHLA) three times, November 19 with Laker Pau Gasol, December 10 and most recently on April 25. He also participated in the 11th annual Community Service Caravan, Pitching in the Community on January 31, taking part in a variety of community service activities throughout greater Los Angeles with his teammates. All Dodger fans are welcome at Viva Los Dodgers, presented by State Farm, Chevrolet and Time Warner Cable, and the event is free with a ticket to Sunday’s game. Fans can get more information on Viva Los Dodgers and purchase tickets for Sunday’s game in order for a chance to take a photo with Puig by visiting www.dodgers.com/viva, www.losdodgers.com/viva or by calling 866-DODGERS.